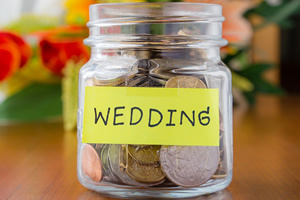 You can still have your dream wedding on a budget. There are many ways to make your wedding less stressful on your savings, so that you and your fiancé have more money to spend on things to start your lives together, such as home furnishings. There are some things that might be more important to you and your fiancé than others. Make a list starting with the things that truly matter to you and allocate as much as you think is right. Cut costs on things that are not important or are ‘’extra’’. Consider a worn-once gown, or consider renting it if you aren’t keen on keeping the wedding dress for future generations. Check with the venue of your wedding to see if there are any available days in the current year. Sometimes venues offer lower prices to have the remaining available days booked. Some venues have discounted rates for midweek weddings or in Winter. Limit a traditional open bar to fewer choices. Choose a combination of popular brands people specifically ask for, and less branded names. Consider a cocktail bar, as this is often considered to result in less overall alcohol consumption. Buy inexpensive shoes for you and your wedding party. Chances are that the dresses will be long and no one will see the shoes. Or plan ahead and buy the shoes during the sales period. Use flowers in season: Flowers that are in season and already available are typically better priced than those that are out of season. Consult with your florist or wedding planner about which flowers that will allow you to maximize your budget and still look great. Rates can differ significantly, so if you’re not set on a particular vendors, shop around to make sure you are getting the best deal and the best quality service. Consider less expensive invitations that you can embellish yourself with craft-work. Catering: Choose a variety of food but keep in mind the cost per item. Select a mixture of expensive food and less expensive food. Do not forget that food is the single most important thing that your guests will remember. Most importantly do not go too low in terms of quantity as people will complain if they have to go eat somewhere else after the wedding!